If It's Too Loud...: My Own Worst Enemy - "Paul Revere"
Boston's My Own Worst Enemy released quite possibly the most Boston release in years with their new 7" single, "Paul Revere." The song re-imagines Paul Revere's ride in a more modern day setting, looking for pizza and beer, wandering throughout many Boston neighborhoods. It name checks Boston landmarks such as Winter Hill and Fenway Park. It's a slice of not quite throwback 90s indie power pop, with fuzzed out guitars and a chant along "Hey!" The b-side is another tribute to one of Boston's own. "Angel of the Underground" sings the praises of Mary Lou Lord. The title comes from both Mary Lou's love of championing and promoting lesser known bands (she was an early supporter of both Nirvana and Elliott Smith) as well as her tendency to busk in the T. It's a loving tribute to someone that's slipped out of the spotlight a bit as of late. 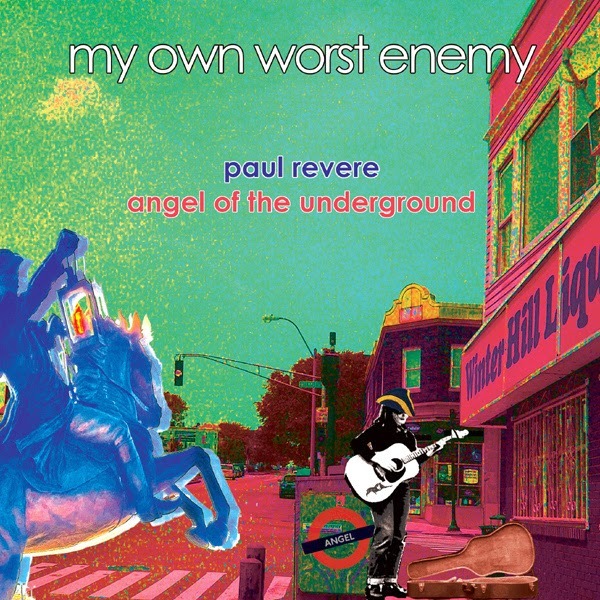 You can listen to and purchase "Paul Revere" on My Own Worst Enemy's Bandcamp page. For more information on My Own Worst Enemy, check out their website.